Eagle Energy, the world’s first caffeine infused energy inhaler, is launching its latest campaign, Stay Sharp. The Vancouver-based company is aiming to distinguish its nicotine-free inhaler in a sea of sports energy drinks. “To make an effective caffeine product that addressed all the negatives associated with drinks, we had to look at new innovations. Through inhalation we could create a natural product made up of guarana, ginseng and taurine, and leave out the sugar” says Marketing Director, Matt Lang. In an act to exemplify what can be accomplished with this revolutionary new way to consume energy, creative agency Cossette Vancouver developed a 60-second video that aims to exert as much mental energy as possible. · Rigging over 70 paintball guns to fire the word ‘ENERGY’. · Building the words ‘NO FAKE STUFF’ in giant typography using pounds of sugar and thousands of energy drink cans and cigarettes. · Creating the words JUST ENERGY using 13,000 matches. · Writing the words STAY SHARP with over 2,000 pencils stuck in ceiling tiles. · And finally, blowing up three handmade piñatas before revealing the tagline, UNLOCK YOUR MIND. 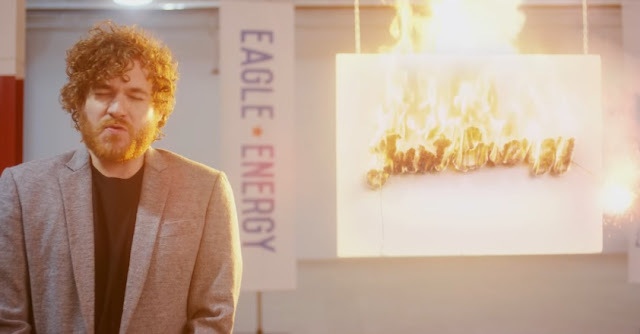 “Eagle Energy is all about mental energy and we wanted the creative, and creative process, to reflect exactly that,” says Michael Milardo, Executive Creative Director of Cossette in Vancouver. “So the team put a ton of mental energy into developing these stunts and building them"
The campaign will run online with paid media in the US, Japan and China.